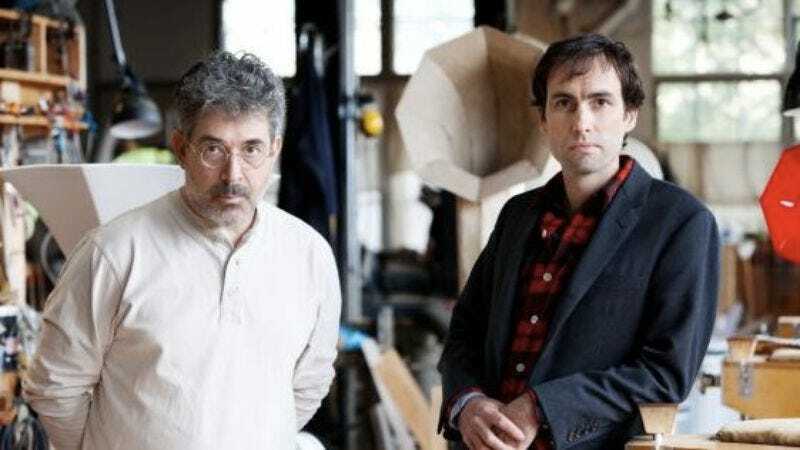 After the project’s haunting debut at the Guggenheim last year, Andrew Bird brings his Sonic Arboretum project to the MCA Dec. 6-30 in what’s sure to be remembered as a mind-blowing experience in immersive sound environment, even as Bird and his collaborator, Ian Schneller, deny any explicit interest in theories of sound art. Instead, using dozens of sonic horned speakers of various sizes designed by Schneller, a renowned Chicago-based custom-instrument maker and designer, Bird will create a “sound garden” of these horned speakers that will amplify and record his sound through multiple loops as he moves through the MCA atrium recording mostly instrumental violin music. In addition to performances on Dec. 21 and 22, Bird’s initial recordings from the installation will also be played on loop in an ever-changing interactive concert for MCA visitors who move through the space. If not art for art’s sake, though, what’s the impetus behind such an ambitious project? The A.V. Club had to know, so we talked to Bird himself. Turns out, it’s got more to do with the countryside than theories, despite being set in an art museum. The A.V. Club: Is the Sonic Arboretum project more about a permanent sound sculpture or a recording project? Andrew Bird: I’m definitely not just seeing it as a recording project. It’s more of a live experience of looping, but with memory. I’m actually going to play the music for the installation in the MCA space during museum hours during the first couple days, workshopping it, using the same techniques as at the Guggenheim and an interface that will keep it streaming, which is something we haven’t really tried before, so it’s less something canned and then played back. It will probably end up being about an hour and a half of multiple elements sent to different areas in the space. I’m most interested in devising a way to move the music and have it shift through clusters of horns, like wind blowing through a field. Ultimately, I want it to move beyond a show format to create a sense of movement. I was in Zion National Park last summer, and I’m still thinking about the acoustic properties of that space as a contained area, and that’s on my mind thinking about Sound Arboretum not just as the acoustics of interior spaces, but more like the acoustics of natural environments, like an absorbent forest, a field of snow. I think of it in those terms, of what’s going to fill that environmental space. I’ll be breaking down elements of what I do in my songs into motifs, clusters of forms interacting with each other. There will be a considerable amount of unknown. Andrew Bird and Ian Schneller's Sonic Arboretum from MCA Chicago on Vimeo. AVC: Is it different to have so many factors affecting your music? AB: It’s interesting. Sitting down with Ian and Neil, the guy helping us do the storing and streaming part of it, there’s lots of interesting problem-solving going on, asking, “How do we get from here to here?” I simply don’t know how it’s going to play out, which is why exposing the process is kind of cool. [Laughs.] But I’m still accustomed to playing rock shows, where you’re not asked to explain your motive, and I know it’s very different in the art world. When I finish a record and put pieces together, I explain myself post-process, and hopefully it’s the same with this. I’m just doing this project because it’s going to be interesting. AVC: So you’re not working with any grand aesthetic theories? AVC: You’ve been collaborating with Schneller for over a decade, but what was the moment when you decided Sonic Arboretum was the big project? AB: I don’t remember where the seed for the actual idea began, but one major visual idea was being out at my farm in a field of soybeans with the wind blowing through it, and that kind of visual world experience. The music I’ve been making at my barn has recently been maybe less about song writing and more about just sounds. Exploring could be just static loops, multiple sources of sound that kind of envelop you, with so many notes in loop that your brain can’t process it all. But it has this cumulative effect of time slowing down. Listening to this kind of sound actually affects the way you see things, and so here we are translating that experience to sound sources that look like plants. I think creating that effect, that feeling of music making your environment slow down, is the greatest hope that I have for Sonic Arboretum. It doesn’t happen very much, and it’s generally become a mostly cinematic device, you know? But it’s incredibly effective, and when it happens in life, it’s way cooler than when it happens in film. So yeah, I think that’s what I would hope people would experience most of all, that it would help you slow down.